This year it was leading UK digital media owner JCDecaux who picked up the ‘Reggie’ for ‘Best Original Digital Billboard’ at The DailyDOOH Gala Awards. 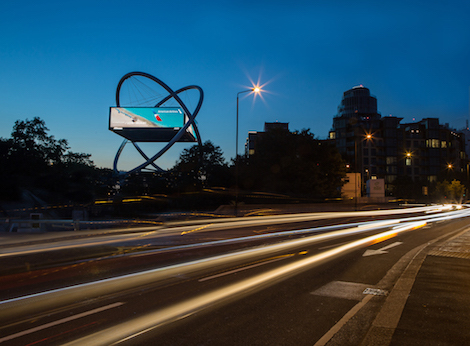 It was awarded for their iconic Wandsworth Roundabout site which was launched in September 2016 and offers over 200 square metres of digital space. The superstructure delivers 2.6 million impressions every two weeks (Source: Department for Transport). The DailyDOOH Gala Awards recognise excellence and promotes best practice in the digital signage and Digital Out-of-Home industry. The awards ceremony took place on Thursday December 1, 2016. This entry was posted on Monday, December 5th, 2016 at 12:09 @548 and is filed under DailyDOOH Update. You can follow any responses to this entry through the RSS 2.0 feed. You can leave a response, or trackback from your own site.